Each day for 25 years, between 1968 and 1993, a man called Stanley Green would rise early, enjoy a spartan breakfast of porridge and an egg, pack up a lunch of apples and vegetables, strap them along with a placard and some pamphlets to a bike and cycle the 12 miles to Oxford Street from his home in Northolt. There he would share his ideas for improving the physical and psychological wellbeing of the country, based primarily on the idea that the consumption of too much protein led to the moral turpitude he had first encountered in the Navy during the War and which had then infected the whole country. On Saturdays he would decamp to Leicester Square to spread the word there, selling his pamphlets and presenting his placard to the cinema-going public. He began his crusade at the age of 53, then stuck at this resolutely for fully quarter of a century. 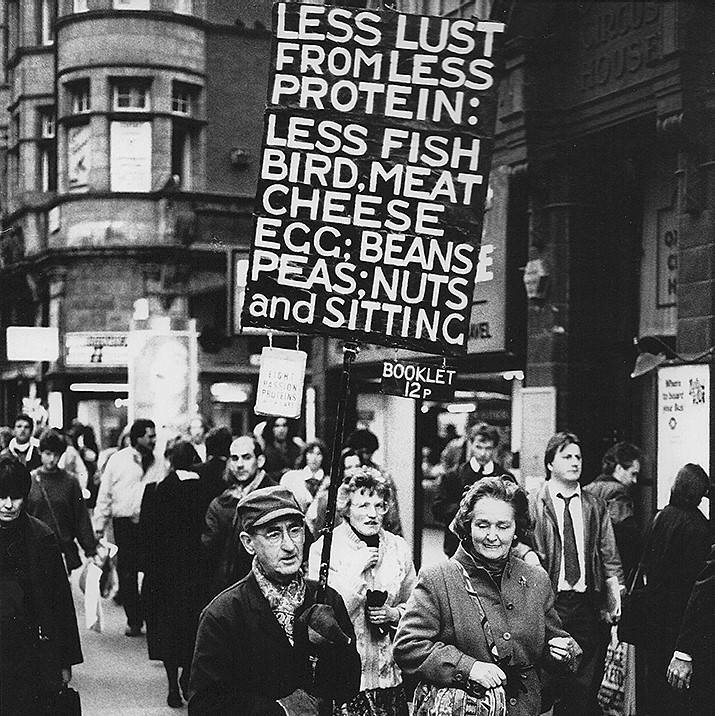 His message evolved just once, to incorporate his belief that too much sitting was almost as big a problem as the eight ‘passion proteins’. 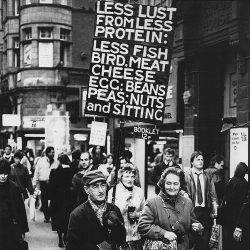 According to his theory, these were “Meat, Fish, Bird, Egg, Cheese, Peas, Beans and Nuts”. 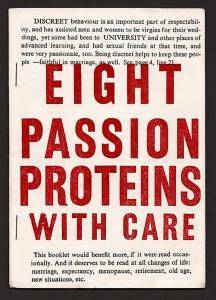 These were the raw materials of the ‘Protein Wisdom’ that was the subject of his eccentric pamphlet. His placard, by now a common sight bobbing over the heads of the people milling around Oxford Circus, now incorporated an additional sign beneath the main banner, warning of the dangers of sedentary life. Too much sitting, he argued, just formed more protein. Now, belief in the perils of sitting is something we share with Green. Not because we fear it will lead to the creation of even more protein to inflame our already blazing libidos but for an idea that is almost as unfounded. The idea that Sitting is the New Smoking has achieved the mainstream acceptability of which Stanley Green could only dream. This specific wording appears to have come for an article in the Harvard Business Review in January 2013 and subsequent Ted Talk by Nilofer Merchant. When you actually examine what she is saying, however, what emerges is an intelligent, informed and nuanced take on the need for us to address the fact we spend too much time on our backsides staring at computers. She is saying that we need to move and vary our posture far more. She’s right, of course, and we’ve known that for a long time. None of that seems to matter as the layers of meaning have gradually been stripped away, faded and vanished so that all that remains is the narrative headline, a Cheshire Cat’s smile of sloganeering. The upshot is that a growing number of people seem to believe that sitting itself is bad, rather than too much sitting. By the end of his remarkable life, Stanley Green claimed to have sold some 87,000 of his pamphlets. He had been embraced by (most of) the people of London as one of the city’s eccentrics and had even taken part in a fashion show for Red or Dead at the invitation of Wayne Hemingway. Nowadays, he’d be part of the mass of eccentric and lunatic voices online and so unlikely to get his message across through sheer dogged adherence to it.